The first step in customizing an Excel pivot chart is to choose the chart type that you want. When the active sheet in an Excel workbook shows a chart or when a chart object in the active sheet is selected, Excel adds the Design tab to the Ribbon to allow you to customize the chart. The second command from the right on the Design tab is Change Chart Type. If you click the Change Chart Type command button, Excel displays the Change Chart Type dialog box. In Excel 2007 and Excel 2010, you use the Design and Layout tabs to fiddle around with your charts, so the location of the command buttons you click appear in different places. The Change Chart Type command button, for example, appears as the leftmost command on the Design tab. The Change Chart Type dialog box has two lists from which you pick the type of chart that you want. The left chart type list identifies each of the 11 chart types that Excel plots. You can choose chart types such as Column, Line, Pie, Bar, and so on. 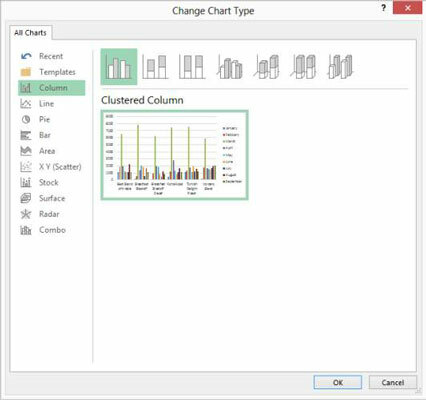 For each chart type, Excel also displays several subtypes; pictographs of these subtypes display on the right side of the Change Chart Type dialog box. You can think of a chart subtype as a flavor or model or mutation. You choose a chart type and chart subtype by selecting a chart from the chart type list and then clicking one of the chart subtype buttons. In the area beneath the chart subtypes, Excel displays a picture of how the selected chart and subtype look.